Former HCN intern Rick Craig (Summer ’91) of Missoula, Mont., recently won top prize in the Chicago Tribune’s 24th annual Nelson Algren Awards. The awards honor previously unpublished short fiction works by American writers, amateur or professional. Nelson Algren, "the voice of America’s dispossessed," is best known for his novels The Man with the Golden Arm, published in 1950, and A Walk on the Wild Side, 1962. Rick’s prize-winning story, "Jerry Morgenthayer, Orem, Utah," tells the tale of a teenage runaway raped and abandoned in rural Nevada. The piece is "as austere and heartbreaking as the Basin and Range country itself," says Rick, who plans to use the prize money to work on his novel. Cindy Perger-Hendricks and Steve Hendricks, from Flagstaff, Ariz., left us a note on an October Saturday: "Traveling through the area on our honeymoon and wanted to stop by and say how much we enjoy your publication." Reader Alan Smith of Colorado Springs, Colo., dropped in after an elk hunt that consisted of "mostly looking." An author from Cortez, Colo., Fred Blackburn, visited us after giving a talk in nearby Basalt on two of his books. The Wetherills: Friends of Mesa Verde describes the "archaeological and anthropological investigations of the Wetherill family" in southwestern Colorado around the turn of the century. Sacred Places of the Southwest features Fred’s text and the stunning black-and-white photographs of Claus Mroczynski . Harry S. Howard of Bozeman, Mont., came by to renew his subscription in person. Robin Smith, a 10-year subscriber from Columbus, Ohio, and his wife, Cynthia Wutchiett, dropped in. They’re hoping to relocate to "an agricultural area that’s not over-developed." Well, we knew of one — but that was before the condos and the Starbucks went in. John Echohawk and Billy Frank Jr. were recently recognized for their work in securing legal and fishing rights for American Indians. On Nov. 2, the two men received the Wallace Stegner Award from the University of Colorado Center of the American West for their "sustained contributions to the cultural identity of the West." 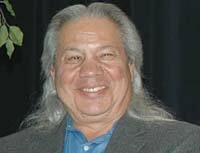 Echohawk, a Pawnee, directs the Native American Rights Fund in Boulder, Colo.; in 1988, the National Law Journal recognized him as one of the 100 most influential lawyers in the nation. Frank, a Nisqually tribal member, fought for decades to ensure treaty-guaranteed Indian fishing rights and now chairs the Northwest Indian Fisheries Commission.